We have come to that time, it’s been fun, it’s been emotional and hopefully we will see you all again next year. 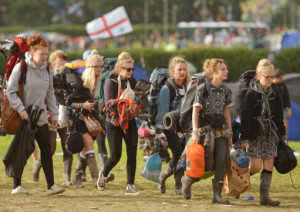 You have partied, song along to all the songs, lost your tent at least twice, your phone once and made lots of new friends. But now it is time to go home. Is it just as easy as opening the gates and letting them head off into the sun? Simple basics are required. The stewarding is robust on the bus and car pick up points. Lost property points and help points are manned. This is basic stuff, something that should be in place to get everyone away from the event. There are a million random things that are unique to each event that have to be considered, but a little bit of planning will get you through it. We can look at this through the DIM model. A waiting area exterior of the campsite should be created for those waiting on friends to catch up. Fire lanes should be kept clear of rubbish and traffic where possible; this allows the smooth flow of customers. Waste areas have been designated, for those that care about the environment. Main routes and fire lanes surface is in good repair and trip hazards removed. 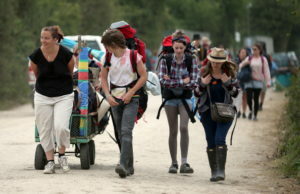 By this point in the event, the customers are well used to the layout of the campsite and should know their way around. The only thing that should be considered is some might not remember how they got into the campsite and need pointed in that direction. Customers should be well informed of the campsite closing time; then there is no excuse when it comes to getting asked to leave. This can be done on ticket sales, websites, social media, on site signage and stewarding. Bus and transport times should be well advertised. 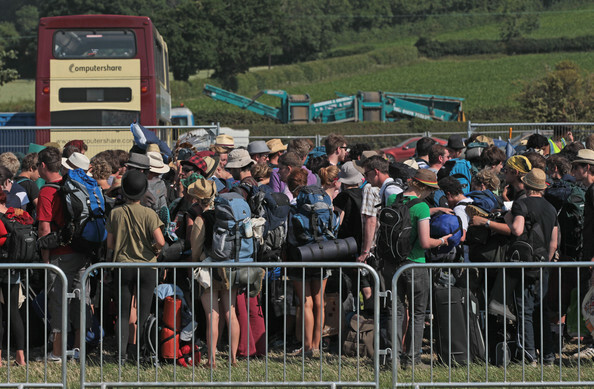 It should be remembered that these will run to a time table and the last thing you want is large queues building up outside waiting for buses. Information on lost property will be required. Some people might not notice something is missing till they are packing up. It is possible that this will be due to theft, so the police might end up busy on site and anything you can do to help I am sure would be appreciated. The roads around the site will be busy, so keep the customers up to date on traffic movement, congestion, jams and breakdowns. Social media is fantastic for this. Contractors know the time when the campsite is closed and they cannot work before this on site. Any vehicles on site are aware of the peak times for the egress, where to avoid due to heavy foot fall and speed limits. Concession stalls and food outlets are provided with times to stop serving at. Information is provided about driving under in influence; remember the party people are still under your duty of care. Help points with phones to assist those that have lost their phones or are out of power to call home or fiends to assist them in getting home. It should be remembered that your customers have had a long weekend and will be tired and the more information and help you can provide to them the better off you and them will be. Deploy your staff where you see fit, either break it down into sections or a big straight line. Your staff have had a long weekend, they will be tired, keep them happy and motivated, plenty of fluids and food, maybe a bit of music will help? Ensure they have the equipment to do the job. Keep the campsite secure; the vultures will be circling. Ensure that only accredited vehicles get on site and minimise the amount of traffic movement. There is mass movement of very tired people. How are you going to ensure the campsite is clear of customers ready for work to begin on the clear up? 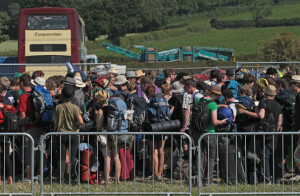 Remember and manage the exterior of the campsite; sufficient numbers of staff to assist at pick up points and bus points. Your staff will see the end is in sight, their homes are calling and they want away. A swift operation will assist, keeping them motivated and focused on the goal. It is essential that the area is clear; after all it turns into a working area as soon as you sign it off as safe. Keep an eye on the traders on site, as soon as they stop making money they will want to leave. I am sure there comes a point on a campsite where you are having a meeting and everyone comes to the same conclusion on what they want for the next 12 hours. End of the entertainment. Happy campers flooding the campsite and carrying on the end of gig celebrations; fantastic. How about the rain starts about 2 hours after the end of show to help send everyone off to their beds. Early morning when it’s time for everyone to head off home. Sun splitting the sky. Then maybe a small shower. Then if God is on your side; large clouds gathering with the threat of a down pour. 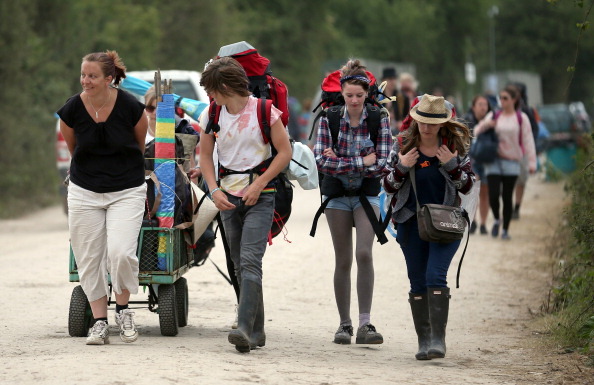 The final hours, everyone is out their beds and packing up – how about light rain to help them move on a bit quicker. Is there anything wrong with this? Not really- unless you are the happy camper that does not want the weekend to stop. From a management point of view, it helps get everyone on their way. If the whole campsite is up partying all night, it is going to be harder to get them moving in the morning. The weather plays a massive part in an egress. 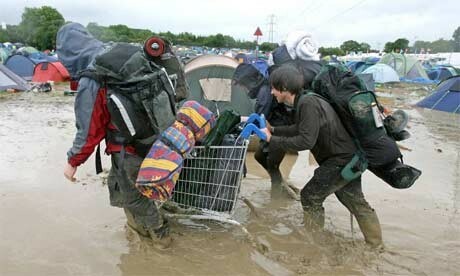 If you have heavy rain, people will be reluctant to come out of their tents; no one wants to pack up in the wet. Also, if the sun is splitting the sky, you will have a slow egress; people don’t want the weekend to end. The weather also plays a part in what people leave behind. In an ideal world everyone will take home what they brought with them, or deposit it in the waste areas. 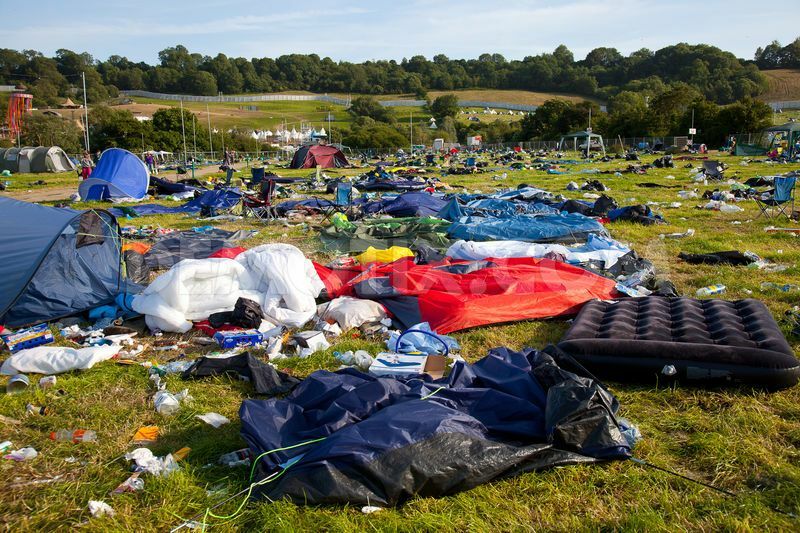 In reality for a lot of campsites this is not the case; it has been used and is disposable. If a tent and camping equipment only cost you £10 – 20 per day to have for the weekend is it worth taking, the time to pack up and the effort to carry it home? A hotel room costs more per night and you walk away from that. If the weather has been wet all weekend, the tent and equipment is covered in mud, there are a higher percentage of people that are going to leave it behind. If you have had sunshine all week, then maybe they will see is as being reusable and take it home. It is not physically possible for your staff to pack away every tent that is left behind, or cost effective. Do you flatten all the tents? Do you just go with the spot check and hope for the best? You also have to consider the health and safety of the staff. 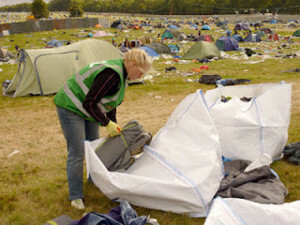 If you have the misfortune of having a mud field full of tents, how do you dismantle the tents? You are looking at staff having to put their hands into mud; what is hidden in the mud. Do you supply gloves, case cutters? There is also the other extreme of when the weather has been hot and sunny; the part time arsonist. These pyromaniacs that wants to burn down the campsite. An unusual past time, but it does happen; the people that don’t have a concern for their own well being or those around them. This is even more dangerous if you have allowed gas canisters onto the site. Even the smallest canister can cause a large explosion, this includes any aerosol canisters. Fire extinguishers, water backpacks and fire fighting equipment is essential for the last night and day. Seems obvious, but it can be over looked. Hopefully by the end of the event, everyone has gone home safe and the planning and effort you have put into the event has paid off.